Justices Seek 'Strict Scrutiny' In Affirmative Action Case On Monday, the Supreme Court sent the University of Texas affirmative action case back to the lower courts, admonishing it to get it right — and make sure affirmative action programs are narrowly tailored. Students calling for diversity protest outside the Supreme Court in Washington, D.C., on Oct 10, 2012. The U.S. Supreme Court has surprised just about everyone with its decision on affirmative action in higher education. The surprise was an apparent compromise that leaves affirmative action programs in tact for now but subjects them to a more rigorous review by the courts. By a 7-to-1 vote, the court largely sidestepped making what could have been a sweeping ruling in a test case from Texas. Instead, the court sent the case back to the lower courts, with instructions to conduct a more thorough factual inquiry. The high court's decision is likely to spawn more challenges like the one in Texas, but it remains unclear how much further litigation will change the status quo. Twice over the past 35 years, the court has ruled that race may be one of many factors considered in college and university admissions. The court has said quotas are not permissible, but in 2003 it reaffirmed that an applicant's race may be considered as a plus factor, just as athletic ability or musical talent is considered. But this term, with the composition of the Supreme Court now more conservative, opponents of affirmative action moved in to kill off affirmative action programs in higher education. And with Justice Elena Kagan recused from the case, supporters of affirmative action thought they were cooked. Abigail Fisher, a white student, challenged the program at the University of Texas, claiming that she was denied admission because of her race and that less qualified minority students were admitted. The university denied that, contending that her grades and board scores were not high enough to qualify her for admission, no matter what her race. Rather than directly resolving the dispute, the court sent Fisher's case and the affirmative action program back to the lower courts for further evaluation, instructing the lower courts to use strict scrutiny, the toughest form of review a court can apply to government actions. Although the Justices agreed that the university has a compelling interest in a diverse student body, they said that lower courts were wrong to defer to the university's judgment; instead, they said the lower courts should have conducted a complete factual review to see if the program was really necessary and whether it was drawn as narrowly as possible. "Strict scrutiny must not be strict in theory, but fatal in fact. But the opposite is also true," Justice Anthony Kennedy wrote for the court. "Strict scrutiny must not be strict in theory but feeble in fact. In order for judicial review to be meaningful, a university must make a showing that its plan is narrowly tailored to achieve the only interest that this Court has approved in this context: the benefits of a student body diversity that encompasses a broad array of qualifications and characteristics of which racial or ethnic origin is but a single though important element." The 7-to-1 vote appears to have been a compromise between the court's liberal and conservative camps. Richard Kahlenberg, a senior fellow at The Century Foundation, admitted to being "puzzled" by the lopsided majority. "The only thing I can think of at the moment is some sort of deal between the justices in which the liberals agreed to new tougher standards," Kahlenberg said. "And Justice Kennedy agreed to procedurally send this back for more review." But Michael McConnell, director of Stanford Law School's Constitutional law center opined that "it's easier to obtain consensus on the court when you say less rather than when you say more." And Harvard's Charles Fried, who served as solicitor general in the Reagan administration, saw the vote as a way to avoid any "radical overturning" of the court's past decisions. Two justices in the majority — conservatives Clarence Thomas and Antonin Scalia — wrote separately to say that they do not think that any consideration of race is ever justified. But for now, both signed on to the court's opinion. Justice Ruth Bader Ginsburg, the lone dissenter, would have upheld the program without returning it to the lower courts. She said that there is "no need for a second look" at this program because the lower courts had already examined it, and that government actors "need not blind themselves to the still lingering, every day evident, effects of centuries of law-sanctioned inequality." Texas is unique among the states. By law, 75 percent of the university's students are admitted under the state's so-called 10 percent program. If a student graduates in the top percentage of his or her class, he or she is guaranteed admission to UT. Because neighborhoods and secondary schools throughout the state largely are dominated by one race or ethnicity, the Top Ten Percent Plan has ensured that roughly 25 percent of the university's students are Hispanic or African-American — not nearly up to the percentage of minoriites in the state, but still a substantial percentage. The remaining slots are filled based on applicants' grades, board scores and other factors, including race. Those challenging the affirmative action program said that because the program brings significant numbers of minorities to the school, there is no need for any consideration of race. But the university disagrees, and on Monday, University President Bill Powers said the university is confident its affirmative action program satisfies the requirements set down by the Supreme Court. But Abigail Fisher, the woman who challenged the UT program in court, said she felt vindicated, adding, "I'm very confident UT won't be able to use race in the future." Stanford's McConnell supports that view, but only partially. "The court has made it significantly more difficult for universities to justify the explicit use of race in their affirmative action plans," he says. 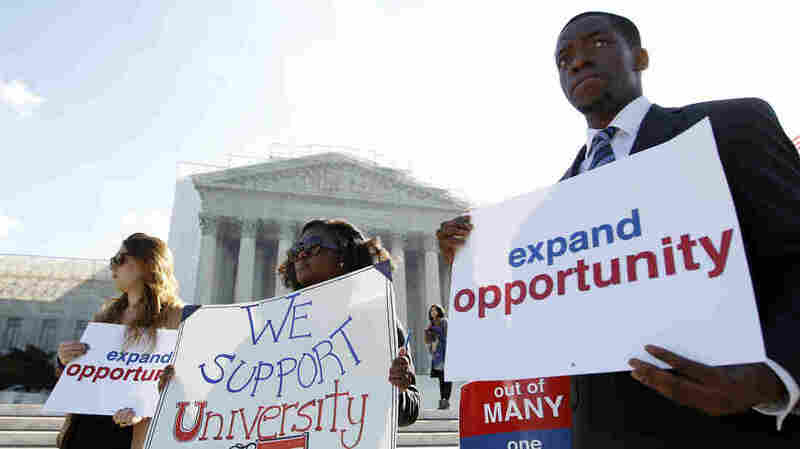 Nonetheless, he adds that Monday's ruling leaves enough uncertainty that he does not expect most colleges and universities to change their affirmative action policies for now. Other experts, of varying ideological stripes, agree. Emory Law School Dean Robert Schapiro says that the Court in many ways appeared to "punt" on the issue. "The court leaves the status quo pretty much as it is and allows affirmative action, as it now exists, to continue." Jonathan Alger, president of James Madison University in Virginia, said the court's decision is "limited and measured," leaving intact the framework of prior affirmative action decisions. "I think many of us in higher education are breathing a sigh of relief today," he said. Brit Kirwan, Chancellor of the University of Maryland system, agrees, calling the decision "a reprieve" for advocates of affirmative action. "My guess is that universities won't change their actions much in light of this decision," said Eugene Volokh, a UCLA law professor and longtime opponent of affirmative action. "But I do think the lower courts might change their approach in some measures saying, 'well the most recent signal we've gotten from the Supreme Court is that we should scrutinize these programs really quite skeptically, quite strictly." Darryl Bradford, senior vice president and general counsel of Exelon Corp., one of the Fortune 100 companies that filed a brief supporting affirmative action programs, sees the decision as a victory for business. "[Diversity] makes us stronger, smarter, better able to meet customer needs," Bradford said. "Also all of our applicants will have worked in environments that are diverse, which is the work environment that they're going to come into in the real world."